Этот рецепт дала моя знакомая тетя Таня, пирог очень вкусный, никогда не скажешь, что внутри лук. Hello everyone! Today we'll make an onion pie..
My husband thinks onions isn't tasty, but there's shortbread dough, it makes the pie delicious..
Stay with me, let's make it together..
We have a new video from Carpathians, subscribe and watch it..
Mountains in snow, Ukrainian winter - watch it! From the ingredients - flour, butter (can be margarine).. But butter isn't as harmful.. Sour-cream - 20%, not less. Soda and 9% vinegar. Take a large bowl to grind flour and butter..
On a big grater grind flour with butter, like this.. I like shortbread dough, even not sugary.. The butter must be frozen, otherwise it won't be possible to grate.. But it's not for all the recipes. Now, make the crumbs..
Make a hole, add there sour-cream. Mix soda with vinegar and pour into the sour-cream..
Knead the dough, with the spoon..
Now with hands. The dough is sticky, but that's ok. Be sure there are no lumps..
Add a bit of salt..
Wrap the dough into the plastic wrap. Put it into the fridge for 2 hours, better leave it for night..
Let's make the filling. You will need salt, 4 eggs, 4 pcs of cream-cheese and onion.. I have 6 onions, but they are small. If bigger - take 3 large..
Take a good knife. As thinly as possible, slice the onions.. Put the frying pan onto the fire. Take a large frying pan. Add some oil (onions will burn with butter)..
Add the onion. Don't let it become golden.. It should be soft. Stir all the time on a small fire.. When the onion is soft, it's ready. Grate the cheese.. Beat the eggs a bit with knife, add salt. Add some salt to the onion..
Take black pepper. You can take any spices.. If you want, make it hotter, adding other spices.. Herbs. I have a frozen dill. You can take any kind..
Onion is soft, it changed color, no water left. Keep it in the frying pan for 3 min more, and then put into the bowl..
Add cheese to the onion. Eggs later.. Wait until this mix cools down. Try the taste, check if there's enough salt and spices.. Delicious! Reminds me mushrooms. Add the eggs. Stir. The filling is ready..
Take the form.26.5 cm in diameter. Grease with oil the sides and bottom..
Take the dough from the fridge. Make a long roll. Visually divide into 2 parts. Separate one piece, roll 2 others..
Sprinkle the table with flour and roll out the dough..
Add the flour all the time, not to have sticky dough.. If you have a smaller form, cut the ingredients into half.. Put the dough carefully. Take away the unnecessary dough.. If you have a smaller but higher form, it's ok..
Everything is ready - we can bake! You can cover the top with the eggs, but 10 min till the end of baking..
Preheat the oven to 320-338 F. 25-30 min for baking. With a toothpick check if the pie is ready.. I cover the top with eggs. And turn the oven off after 4-5 min. Don't eat it hot.. It must be at least barely warm, so it can be cut.. The smell is incredible. Look at i!. The crust is nice and flaky because of butter.. 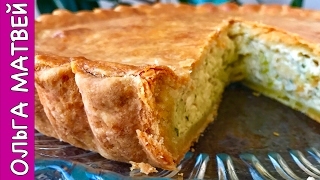 It's a nice pie for any occasion..
Nobody can guess that it's from onion. It feels like mushrooms.. Thank you for the recipe. It's delicious!. The dough is flaky but shortbread too.. I need to save a piece for my friends..
My dog wants it too!. Thank you all, thanks for the recipe. Thanks for being with me. Subscribe to the channel, like and share this video..